This week my #wickedwednesday post is one that has happened before, but ended up with H having all of my toast, and me half a slice of hers… that means she ate 2.5 slices of toast. I just went to pick up my tea, came back and she had most of my jam toast on her plat. Everytime I tried to trade back she screamed. Needless to say I’m hungry! Why children’s organic clothing is important? Hahah yep that’s the one! She definitely eats more for breakfast than me, even without stealing mine! 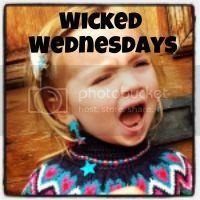 Sharon Powell recently posted…Wicked Wednesday! Sharon Powell on Toddler puzzles: Orchard Toys Once Upon A Time puzzle?